April 7, 2008 by riamn. Average Reading Time: about a minute. On Friday, April 11, and Saturday, April 12, 2008 the Rochester International Association presents its 33rd World Festival at Mayo High School, 1430 SW 11 Av, Rochester, Minnesota. The Festival opens Friday evening at 7 PM with a colorful show of performances including dancing, singing, and music by performers in their native costumes from around the world. Admisson is $8 for adults, $4 for students and children, $20 for a family pass. On Saturday, from 10 a.m. to 3 p.m., the Festival features a full day of activities including the Parade of Nations, dozens of Cultural Displays from around the world representing the rich diversity of our city and region, an International Buffet of Ethnic Foods in the cafeteria, continuous music and dance performances, a new Market Place, and a wide variety of children’s activities. Children’s area runs from 10am until 2pm. Admission is free. The World Festival began as a bicentennial event in 1976, with Rochester Kiwanis as sponsors. Now in it’s 33rd year of celebrating the cultural diversity of the Rochester area, it has become the largest multi-cultural event in Minnesota south of the Twin Cities, attracting thousands of visitors and hundreds of participants. New! 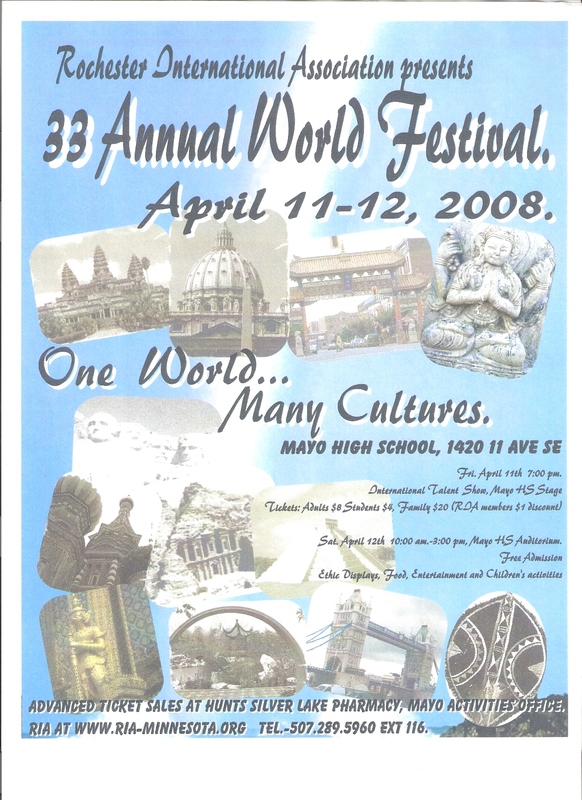 RIA Newsletters – see our current World Festival 2008 edition newsletter.